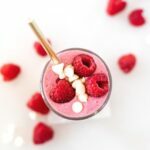 A secretly healthy white chocolate raspberry smoothie is the perfect sweet treat for Valentine’s Day breakfast! What do you get the valentine who has everything? How about showing them you care with a (secretly) healthy but sweet breakfast treat! Or a sweet snack, since I know you are already making my Healthy Red Velvet Pancakes for your sweetie for breakfast… right? 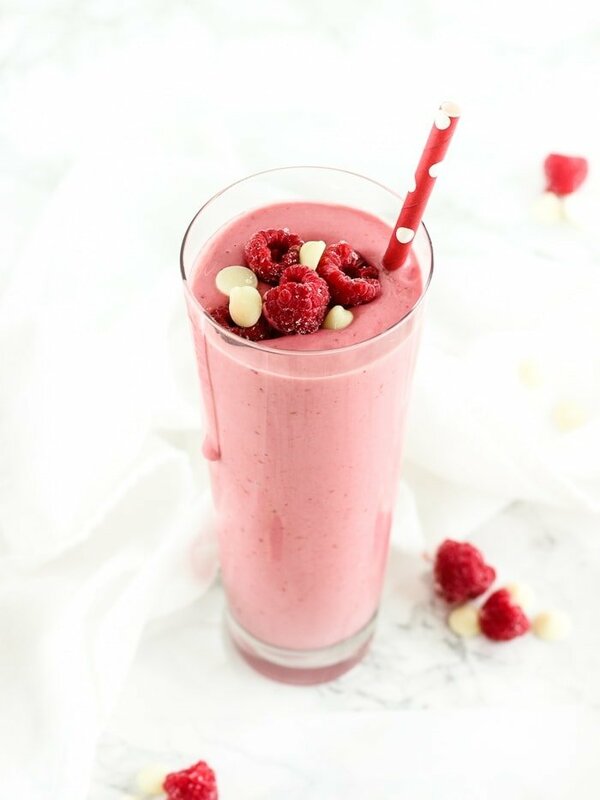 Either way, a creamy Valentine’s White Chocolate Raspberry Smoothie is sure to make your valentine smile! 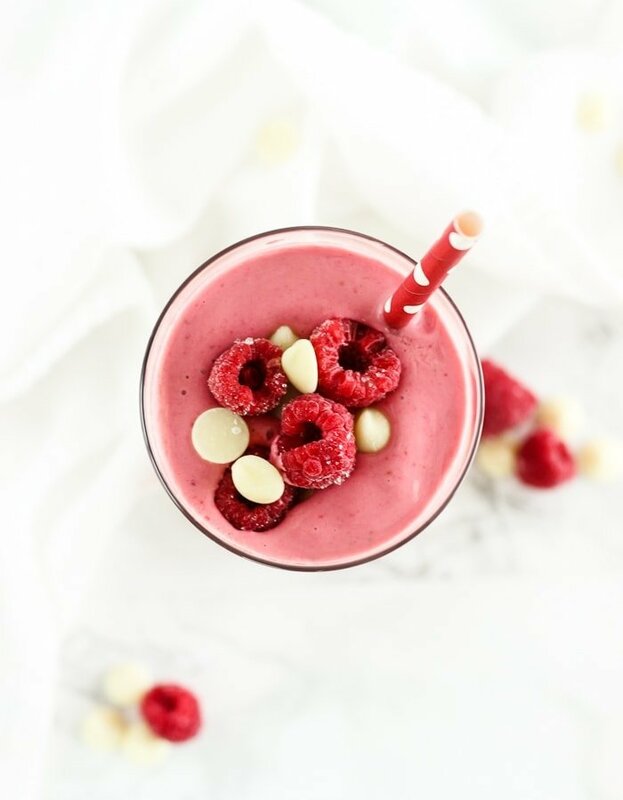 This yummy smoothie is made with white chocolate chips and vanilla greek yogurt for a rich and creamy taste, and frozen raspberries for a nice frosty texture. The sweet red hue is perfect for the day of love! If you only have fresh raspberries, don’t worry. You can still use them! Just add about 1/2 cup of ice so that you still get a thick, frosty smoothie. 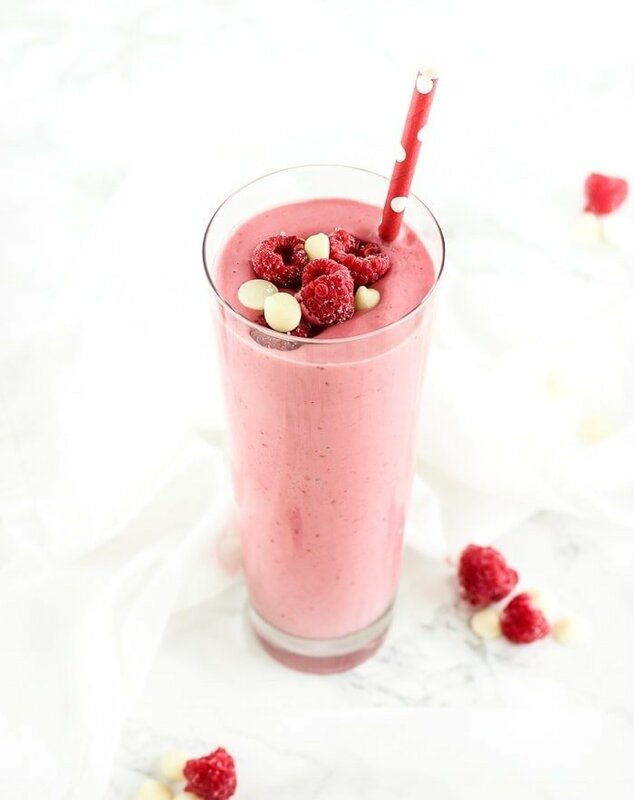 Did I mention that this White Chocolate Raspberry Smoothie is healthy? It’s loaded with calcium from milk and greek yogurt, which also adds a good amount of protein. And raspberries provide a hefty dose of fiber, vitamin C, antioxidants and flavonoids to keep your sweetie’s heart and cells healthy! Make sure you have two straws, because this delicious recipe makes enough to share with your love. Perfect! If you want even more Valentine’s Day smoothie inspiration, head over to Nutritioulicious for a Dark Chocolate Strawberry version I created. Sending lots of love your way! In a small microwave safe bowl, heat white chocolate chips about 30 seconds and stir until smooth and melted through. Set aside to cool slightly. Add all ingredients, including melted chocolate, to a blender (or bullet, food processor, etc). Blend until smooth. Pour into glasses and top with fresh berries. Enjoy! What a great idea for Valentine’s Day – love how pretty this smoothie is! Thanks, Jeanette! Isn’t the color great? I would definitely feel loved if someone made this delicious smoothie for me on Valentine’s Day, or any day for that matter! Ahh brilliant! This looks (and sounds) so tasty! Perfect for Valentine’s Day breakfast!